Welcome to Paloma Elementary School District #94! We are located in Gila Bend, Arizona, in the southwest corner of the state. Our students, from preschool through eighth grade, receive a quality education under the guidance of highly qualified teachers and caring staff. We encourage you to take time to browse our website to see all that we have to offer! 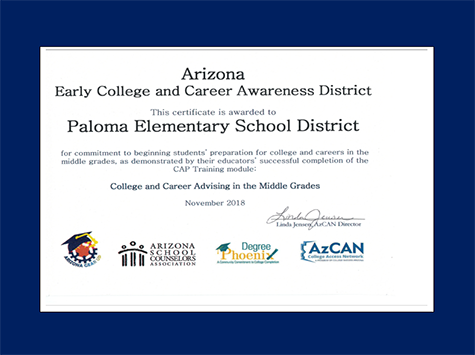 I am proud to announce that our school has been recognized by the Arizona College Access Network as an Early College and Career Readiness school. Currently, we are one of only sixteen schools in the state of Arizona to earn this honor. Receiving this award means that you can rest assured we are preparing your child for their college and career goals.